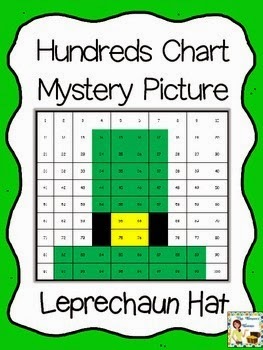 Classroom Freebies Too: St. Patrick's Day Mystery Picture Fun! St. Patrick's Day Mystery Picture Fun! Looking for a last minute activity for St. Patrick's Day? This 100s chart mystery picture gives your students great practice with number recognition and place value, but it's also fun and engaging! Students will use the key to color in the numbers and create the picture of the leprechaun hat! You can also pair it with a writing activity by giving students a fun prompt, such as, "Once I found a magical leprechaun hat. When I put it on..."
I promise your students will LOVE it!